We Have a Regular Day | Sprezzatura, Y'all! Lots of people have asked what a regular day is like for us so I thought I would chronicle a day in the life of our sabbatical. We usually get up about 7:00 or so. Since we sleep with the windows open a little, the neighborhood starts waking up and we hear the beginnings of the day. The street sweeper comes through early to clean up after the evening. He’s quiet, but he knows everyone (we even got a nod from him) and they exchange pleasantries. We have to take the dog out so one of us takes her on a brief stroll, purely for utilitarian purposes, and then we all have breakfast. We usually have fruit and yogurt, my husband makes espresso and I have tea. We eat at the kitchen table and after we’ve done the breakfast dishes, we go downstairs to what I guess is the living room to catch up with the world – emails, news, etc. Since we don’t have a dishwasher, we keep the dishes washed as soon as we use them. They have an ingenious way of drying dishes here. The cupboard above the sink is actually a dish drainer. 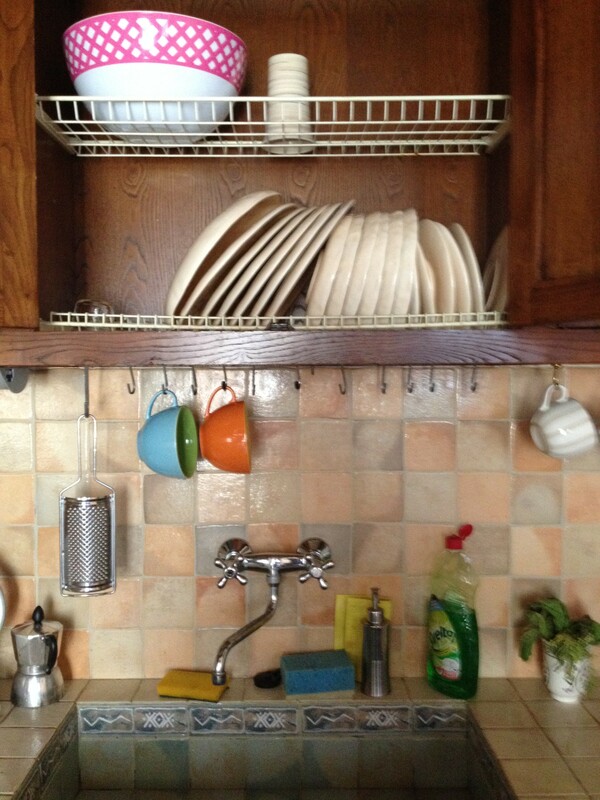 The bottom shelf is actually a wire grid and all the dishes drain into the sink. We usually take a long walk in the morning. We’ve found this great place to walk that’s outside the city walls and feels like it is miles out in the country. 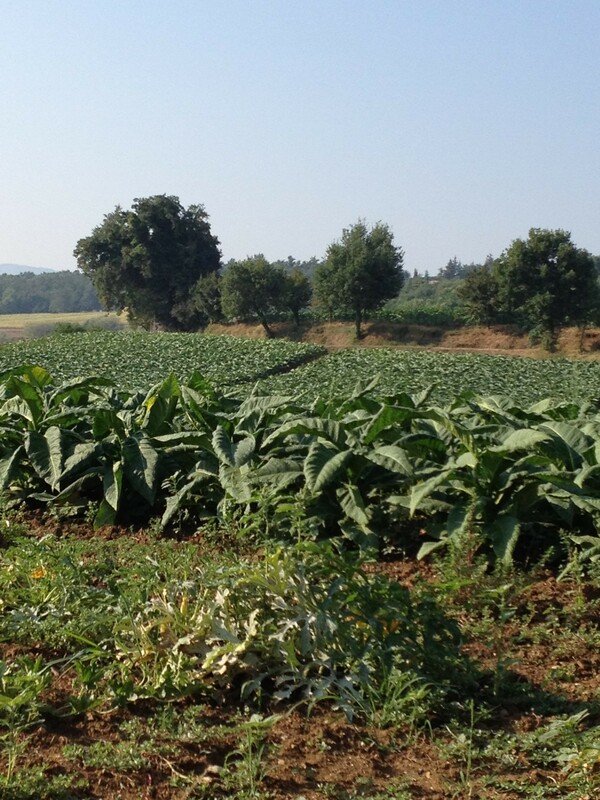 We walk around the tobacco fields and even let our dog off her leash. There are tons of tobacco fields here, which is appropriate since everyone in this country smokes. On our walk, we plan our day. Mainly, we plan our meals. Here the choice is eat a big lunch and a light, or no, dinner. or vice versa. 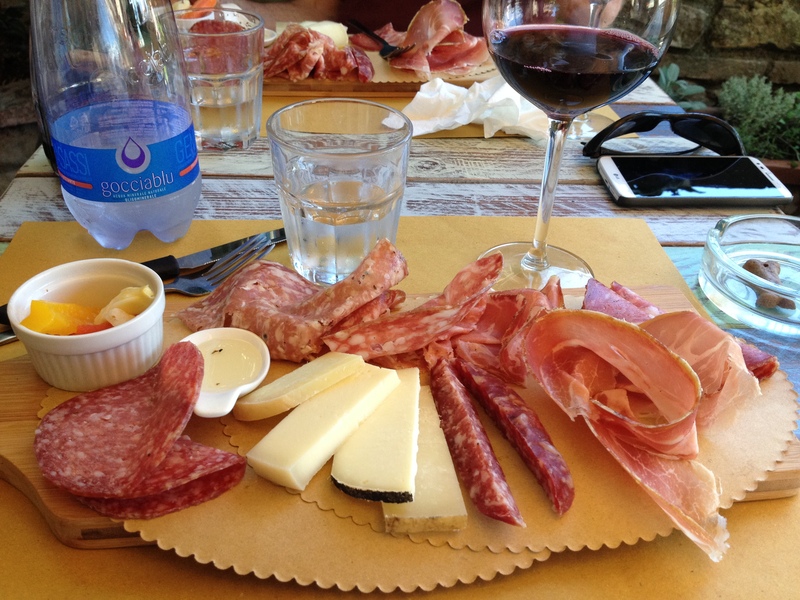 We decided on a big lunch today, or pranza in Italian, and thought it would be nice to drive to a nearby town. We’ll decide where later. Now we’re walking through the tobacco fields looking at this gorgeous scenery. 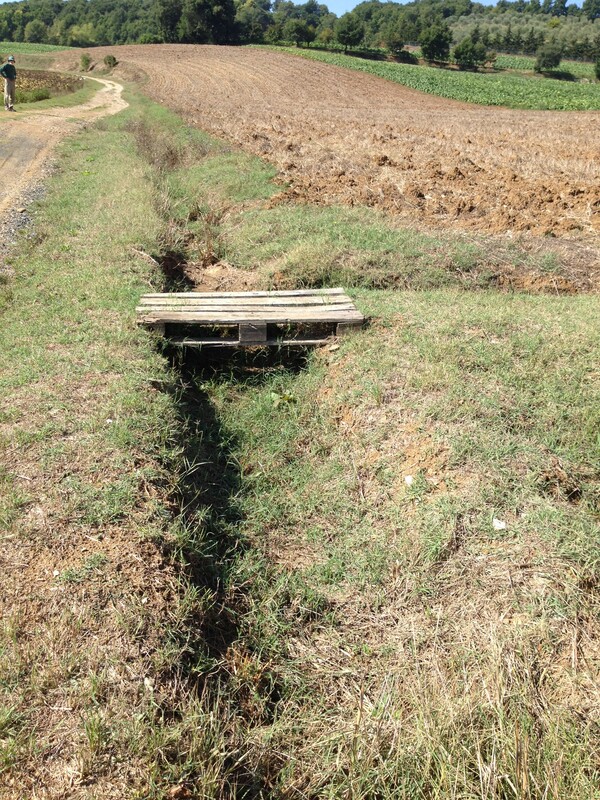 1,001 Uses for Pallets – Use as a Bridge! After our walk, we cleaned up and decided to go to Citerna for lunch. 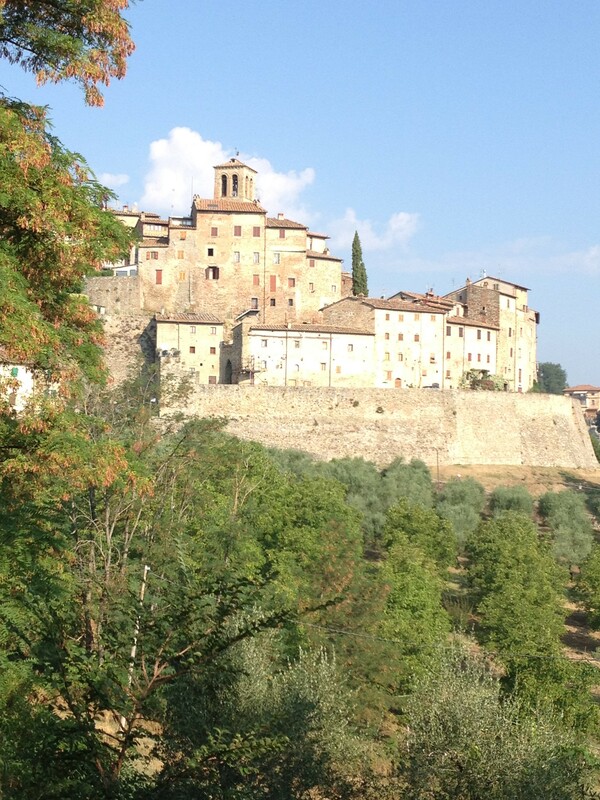 Citerna is a beautiful little hill town near here with gorgeous views. We stopped for lunch at La Cisterna and sat out on their terrace. 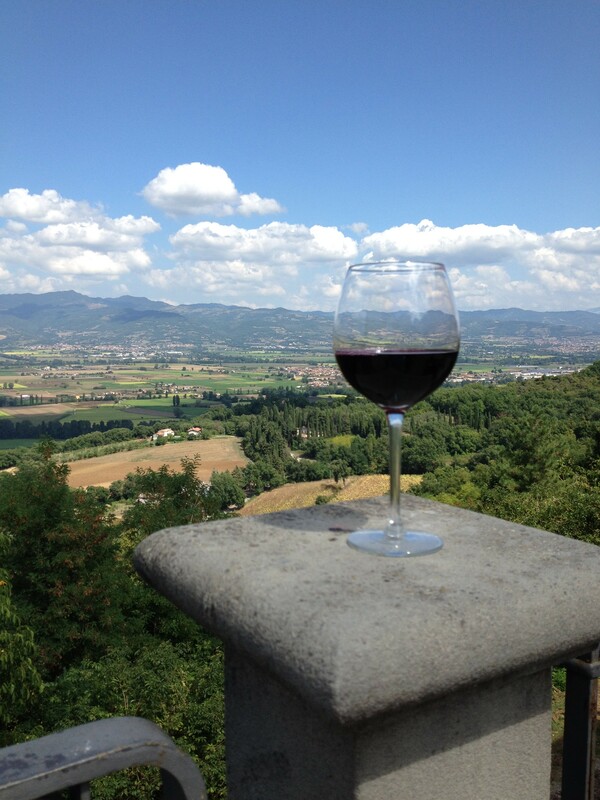 It’s in the main piazza in town and you can see the beautiful view over the Tuscan countryside from the terrace. I know I keep talking about how dog-friendly Italy is, but La Cisterna upped the ante on dog-friendliness. 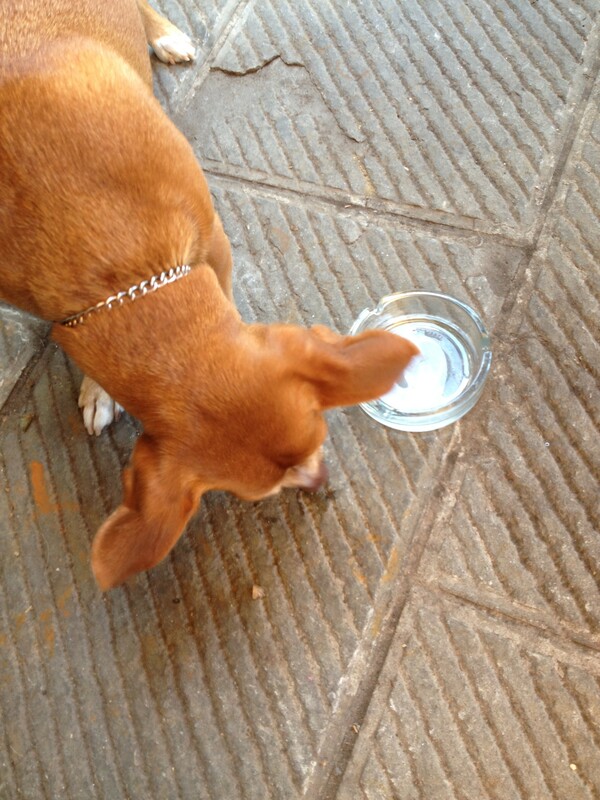 Not only did they give our dog water, a very common thing at restaurants, they gave her own plate with dog biscuits! She was in heaven. My husband and I had our own feast. Panzanella, which is Tuscan bread salad, bruschette, and, vegetarians avert your eyes again, a meat and cheese board. We ate until we couldn’t eat anymore, then we ate some more, then we finally gave up. We still couldn’t finish it. We finished our wine out on the overlook over the valley. 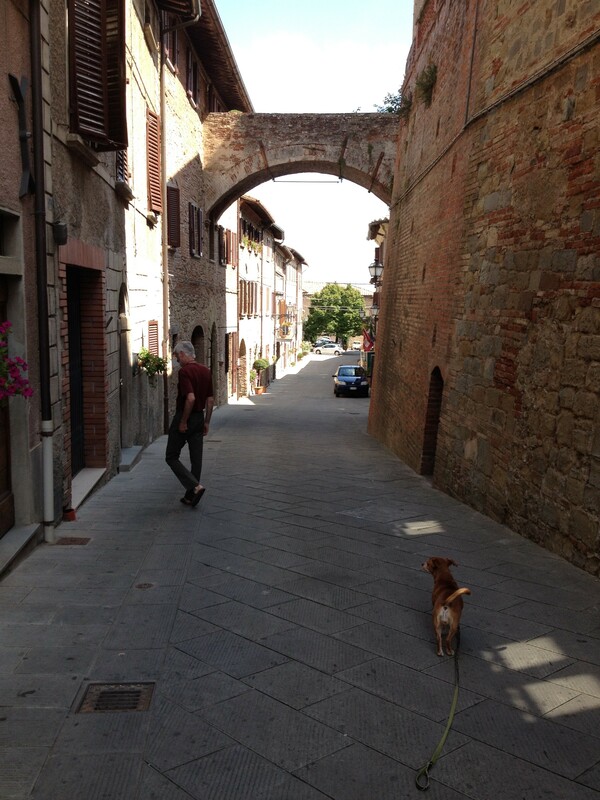 Millie the dog was running around the piazza like she owned the place. After we finished, we drove through the old town of Monterchi, stopped and bought a couple (or four) bottles of wine and made our way home. Some of us napped, some of us worked, all of us were happy. After a while, we walked down to get a gelato (I know, we couldn’t even finish our lunch), then back to the apartment to talk about upcoming visits from friends. Sometime during the afternoon, or early evening – they all kind of run together – our friend Michelangelo called to ask if we wanted to meet them for dinner tomorrow night. Of course! Everyone here drinks bottled water. Even though the water is perfectly fine to drink from the tap in most places, it’s cheaper to buy bottled water. 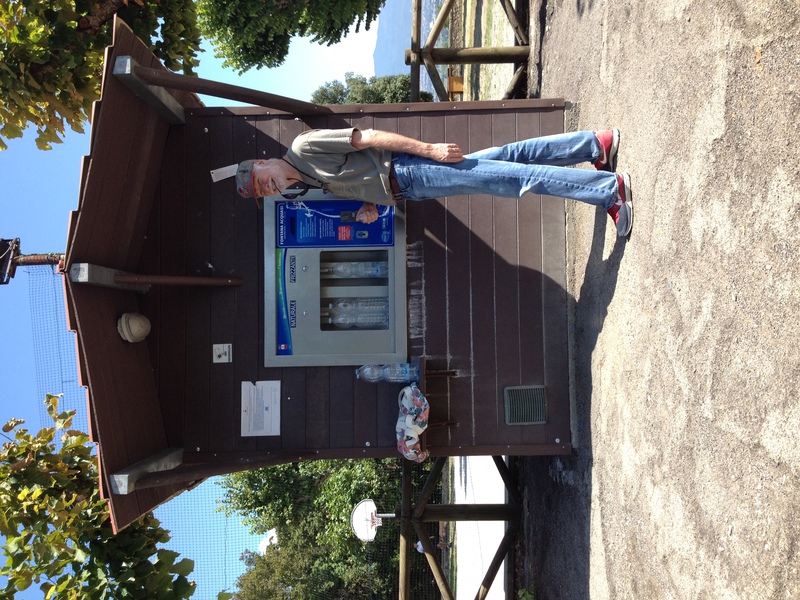 Even cheaper than buying bottled water is refilling your empty bottles at the water stations they have around town. For $.05 you can get 2 liters of water, either plain (naturale) or fizzy (frizzante). There’s always a line because everyone refills their empties here. While we were out, we ran by a little farm stand just outside of town. 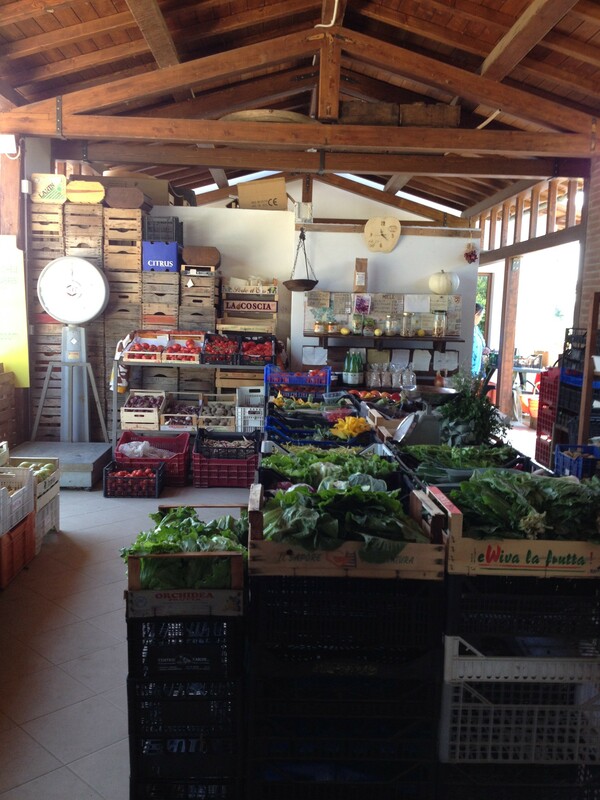 It’s run by Sylvia and her husband and they have the best produce you can imagine. 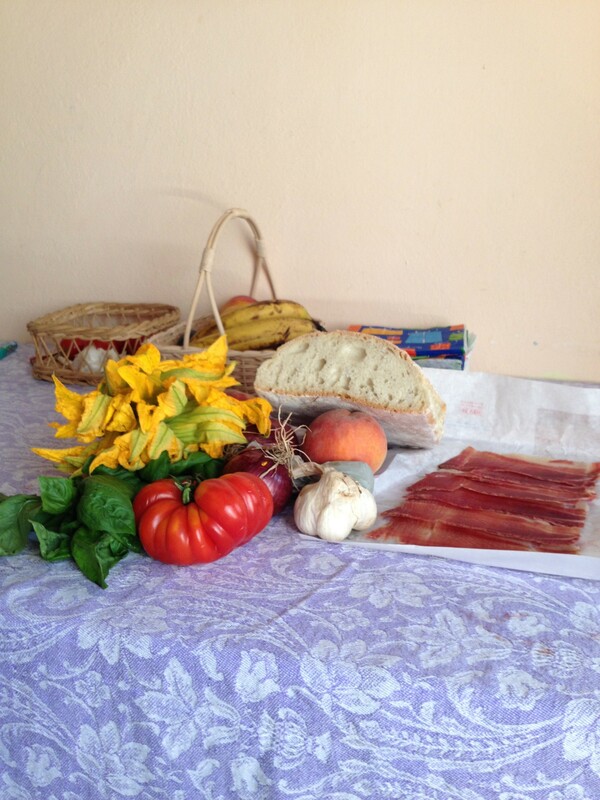 We got squash blossoms, basil, onions, garlic, tomatoes, peaches, bread, mozzarella cheese, and proscuitto. The rest of the evening was spent talking, taking the dog out for a walk, and just generally being content. Tomorrow we’ll get up and do it all over again. Except maybe we’ll have a light lunch and a big dinner. That would change things up tremendously. What a lifestyle! I am loving your country walk, that cheese and meat board and the produce stand!!! Well, everything, really. Thanks for all the pictures, too! Love seeing people and pets we know and love! I’m caught up now and looking forward to MORE! Thanks – glad you’re enjoying it. I can’t write it fast enough – too much happening! What a life! Truly sounds like heaven on earth. I probably shouldn’t come, if everyone smokes !!! Can you give me some advice for G on money? 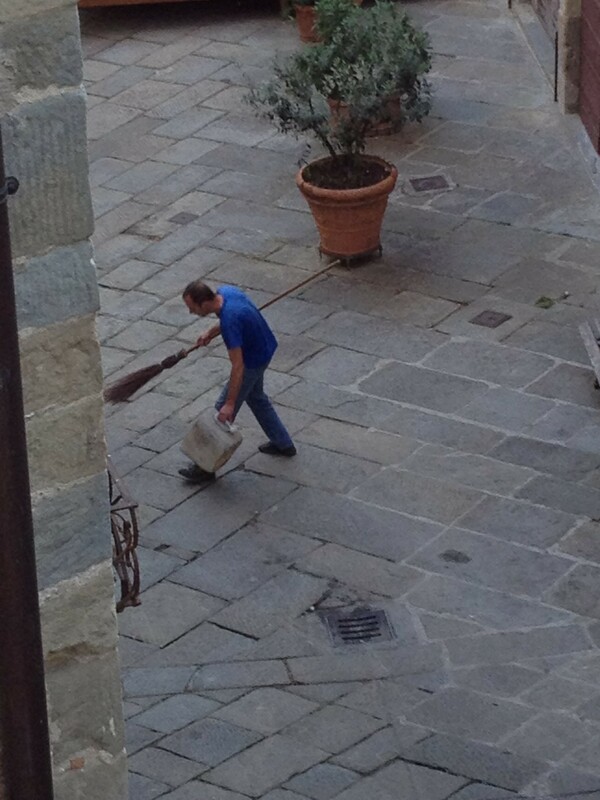 Should he just bring his ATM card and a little cash or what is the best way to do it in Italy?